On the tape releases by Omarosa Manigault, president's daughter-in-law Lara Trump is seen discussing salary considerations with Manigault Newman. Manigault Newman said that she had seen things in the White House that upset her. Former White House aide Omarosa Manigault Newman released a secret recording Thursday in a bid to bolster her contention that she was offered a $15,000-a-month contract from President Donald Trump's campaign to stay silent after being fired from her job. On the recording, campaign aide Lara Trump, the president's daughter-in-law, was be heard discussing salary considerations and other aspects of a campaign job with Manigault Newman and makes clear that she expects her to be positive about the president. The release of the recording, during an interview with MSNBC, was the latest escalation of Manigault Newman's feud with Trump in the wake of the release of her tell-all book, "Unhinged," which depicts him as racist and in mental decline. The president has disparaged Manigault Newman in recent tweets, calling her a "dog" and "lowlife," among other things, and his campaign has filed an arbitration action in an attempt to silence her. On Thursday afternoon, the president retweeted a video sent out by the Republican National Committee featuring clips of Manigault Newman lavishing praise on Trump in various venues. "Thank you for the kind words Omarosa!" Trump said in the tweet. According to Manigault Newman, the recording made public Thursday is from Dec. 16, just days after she was fired from her job as a White House aide by Chief of Staff John Kelly for what Kelly has characterized as concerns about her ethics and integrity. During their conversation released Thursday, Lara Trump references a New York Times article from the day before that included comments by Manigault Newman that were critical of her time working for Trump. Manigault Newman said, for instance, that she, as the only African-American woman working in the White House, had seen things that upset her and considered that "a profound story that I know the world will want to hear." "It sounds a little like, obviously, that there are some things you've got in the back pocket to pull out," Lara Trump is heard telling Manigault Newman. "Clearly, if you come on board, like, we can't have --"
"Oh God, no," Manigault Newman responds. "Everything, everybody positive, right?" Lara Trump said. The proposed agreement said that Manigault Newman could not make any comments about President Trump, Vice President Pence or their families or any comments that could damage the president. It said she would do "diversity outreach," among other things, for the campaign. "She made it very clear that if I joined this campaign I'd have to be quiet," Manigault Newman told MSNBC's Craig Melvin on Thursday, referring to her conversation with Lara Trump. "I saw this as an attempt to buy my silence." In a statement released after the television appearance, Lara Trump said that after Manigault Newman was fired by Kelly, "my entire family was concerned for her because we had no idea about the basis of her dismissal." "We still wanted her on the team because we cared so much about her personally," she said. "That's why I reached out to her to offer her a position with the 2020 Trump Campaign before we knew anything about the gross violations of ethics and integrity during her White House tenure." Manigault Newman, a former contest on Trump's NBC reality show, "The Apprentice," said during Thursday's television interview that she is prepared to continue sparring with the president. "I think you should watch his behavior and how he's unraveling, and I don't have any fear," she said. "I have a whole community of faith that's behind me, praying for me. And no matter who is in the Oval Office, Donald Trump needs to remember that God is on the throne." In her statement, Laura Trump said she felt betrayed by Manigault Newman. 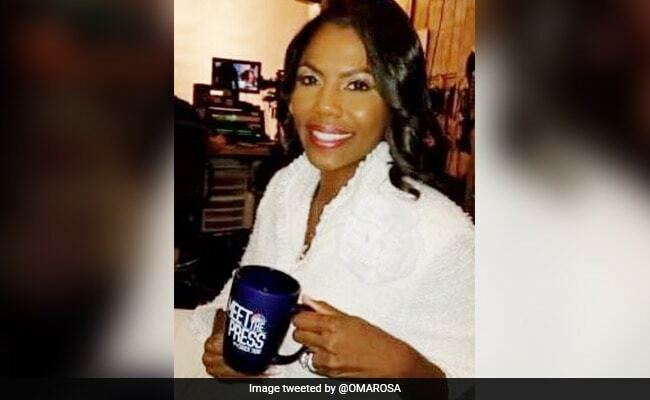 "Woman to woman, I shared a connection with Omarosa as a friend and a campaign sister, and I am absolutely shocked and saddened by her betrayal and violation on a deeply personal level," she said. "I hope it's all worth it for you, Omarosa, because some things you just can't put a price on."